Weekend before last, I saw a really amazing conversation with and performance by Nona Hendryx, still amazingly vital as a musician into her 60s. 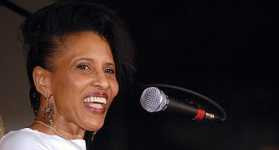 The event covered a great many topics from her long history with Labelle and then as a solo artist. This was the first in a series of encounters with black rock musicians planned by BoldasLive. She has a new rock musical in the works that will be debuted at Joe's Pub in October, as well as a Labelle reunion record that is in progress. This "Winds of Change" that dates back to her involvement in the struggle against apartheid in South Africa and the Sun City project, as well as just being an incredibly powerful song.